Many of us dream of leaving a legacy behind and there could be nothing more rewarding than the knowledge passed on to generations through a book. But of course, the process of such big responsibility is neither small nor easy. 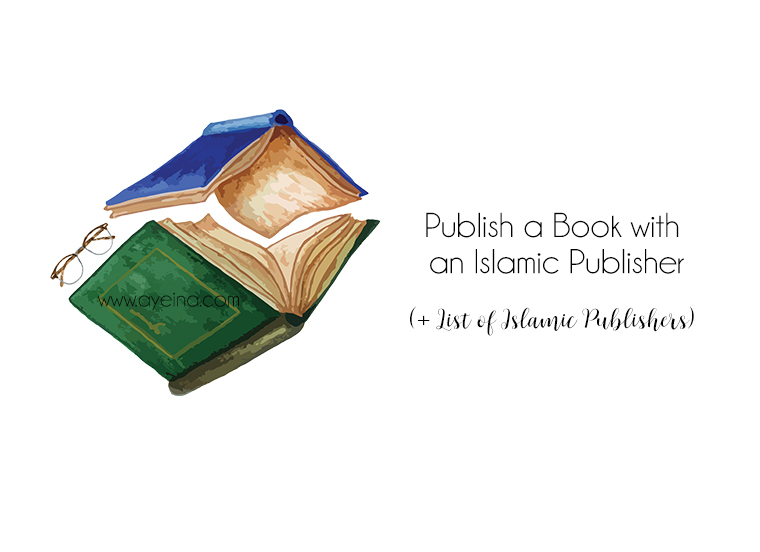 In this post, we will discuss publishing your writing with a traditional publisher to leave sadaqah jaariyah for yourself in this world in shaa Allah. A publisher is someone who buys the right to publish your book and pays you royalties from the sales. The publisher will usually invest in editorial, copy editing, and design/illustration work. They’ll also invest in sales and marketing – because of which publishers get to control almost all key decisions for your book. If you do not want to extensively look after the sales & business side of things, then traditional publishing is ideal for you. Intention is a good place to start with. Just remember – if you’re planning to publish a book, writing is hard work! So ask yourself WHY are you doing this? Are you writing just to cross a checklist in your list of accomplishments, to put your name out there? To make some money? To gain some fame? If you’ve said yes to any of these questions and that is your sole purpose, then writing a book may not be for you as the passion wouldn’t last long that way and without it, your work will not be a unique creative idea brought to the world. It may just seem pushy, plagiarized or simply dull. If you’ve said no as an answer to the above questions then after polishing that intention, it’s time to work on finding your passion! “I find my inspiration in lots of different places. At times, it’s a story about someone overcoming something; at others, it’s something I pick up from a book. But going below the surface, my core value of making a difference is what inspires me every day. I believe that’s what I’m meant to do, and as a Muslim, it’s my duty to strive towards enhancing my own potential and supporting others to do the same. The same value inspires me whether I’m coaching someone, or writing an article”. If defining your passion seems like a difficult task, it’s best to think that you have only few years to live. What would you be working on day and night if you had only few years to live? What kind of legacy can you leave behind? – Am I doing what someone else has already done? If yes, how can I make it at least 50% different? (Because inspiration is fine, but plagiarism is not – if your product looks exactly like another product (or even close) – then it’s time to move on)… Why waste time in recycling when there is so much new to learn and discover! Do not write for world considerations, only the Almighty can raise you in ranks! – Who am I creating/writing for? (Who is my audience/ who would I like to target?) Make a list with as many subheadings as you can! (for eg: Muslims – Muslim mums – Muslim mums who want an imaan boost etc.) This process will help you understand your audience better in shaa Allah. – Am I willing to spend significant amount of my time working on my idea? (Perhaps some sleepless nights too?). For creative writing, utilize the time before/after Fajr – when your mind is well rested and fresh with new thoughts, that is the time when you can work on extension of your ideas. Once you are done (weeks later or years later – it’s ok), this is where the real challenge begins! Remember, all great books that are currently published didn’t necessarily start off great. No matter how passionate you are about your submission, you have to accept that there’s always room for improvement and that’s where the editor comes in. Try your best to edit your work as critically as you can before submitting it to the editor. It’s important to understand that the relationship with the editor is two-way. They will try to work on and improve your ideas, but you’re the one who has to make most of the efforts. *Ask fellow writers – those who know how to write will have some insight into what works and what does not work in a book. *Ask voracious readers – people who read a lot will be able to tell you if your book is good enough for the masses or no. *Ask someone who knows your subject – if you’re writing non-fiction, about something in a field such as business, science, or cooking – ask someone who is an expert in this field to see if you really know your stuff. Now it’s time to look into the option of which traditional publisher to go with? Which one suits your genre best! It’s important to find out all you can about the publisher or publishers you plan to send your book to. Some publishers require a submission (a proposal or idea) whilst other publishing houses require your work to be reviewed and submitted to a literary agent before it can be submitted. Try to learn as much as you can from their website, books and information from notable authors. Once you embark on a journey, you may be rejected over and over, so ask yourself – Am I passionate enough to take on rejection/criticism and still go on? But also flexible enough to accept and improve as I go? A) It might be that your book is similar to a book they’ve already published or they’ve already received. (Or it’s something similar to what’s already out there). B) It might not fit in with the house style of the publisher. C) Your content needs a lot of editing. This varies from publisher to publisher, some publishers are lenient and try to maintain a relationship where the author has an input on the cover, text formatting, font, etc. Whereas others have an in-house style that is strictly followed. It really depends on the type of book, what the publisher has already published and the resources available to them. It’s important to understand that the publisher has to consider the commercial aspects of printing in regards to their competition. Sometimes you may have a say on it, sometimes you don’t. It’s really hard for Islamic books to come to life as the target audience is really narrowed down and hence it gets pricey to print them. Due to low demand, publishers end up printing only a little amount which is more expensive in the long run. And with bare funds available, most are paying from their own pockets and hence the prices aren’t as low as secular books. People usually complain about that, but forget to contribute to the solution. The more Islamic books you buy, the more the demand – the more the selling, the better the chances of printing in bigger and cheaper bulk and hence the price can be lowered significantly based on that. Some people buy books because of the quality of printing or how it looks, some people buy them because they are cheap, some people buy them because of the content it holds and the difference it will bring in their lives. The reasons may vary and we may have to keep everyone in mind. Moreover, despite the importance of reading in our faith, there are many other activities that compete with Islamic related books, – online lectures, articles on the web, social media, various apps etc. Alhamdulillah many of younger generations of Muslims are engaged and have a thirst for Islamic knowledge, guidance and literature. However we have to accept it as a reality, many Muslims are also turning to other resources to learn about Islam. Publishers will usually price your product according to what they think best – based on different factors – material, size, competition etc. It took us many prints and bindings of #AlhamdulillahForSeries to finally settle with two sizes and prints. . . The spiral one was good but felt shaky. The hashtag above seemed odd. The photopaper looked so good, but one could not really write on it. It took us multiple experiments with materials and printers to finally decide. And guess what, we can still think of thousand ways it can be improved. But perfection has no boundaries. Your product may not seem perfect to you, but if it puts a smile on someone’s face, the job is done. Sometimes you just have to let perfection go, to keep your sanity alive! Focusing on current trends, it’s vital that the author themselves are pro-active in marketing and creating an interest for their own work. Gone are the days where the publishers did the bulk of the work – now the focus has shifted to an author-led approach. As marketing is all about understanding people, ask yourself how are you going to target the right type of people and convince them that your book is worth their time and money. Have you seen some books that are absolutely brilliant, but nobody knows about them? And have you seen books that are very poorly written, completely plagiarized or are full of hate – and yet do so great? It all comes down to marketing! Your book depends heavily on it – probably 80% – or even more (sad, but a bitter truth). You can’t expect the book to sell itself. Have you written a book but don’t know how to move forward with it? Here is a list of Publishers that accept manuscripts from Muslim Writers – including KUBE PUBLISHING (one of the oldest Islamic publishing companies). BIO: Kube is an independent publishing house that publishes general interest, academic and children’s books on Islam and the Muslim experience. Inspired by our Islamic faith, Kube is committed to serving Muslim communities worldwide by publishing innovative, relevant and authentic books. In today’s ever changing world, Kube seeks to enable Muslim spiritual, cultural, intellectual and creative expression in ways that are engaged and exciting, traditional and modern. I intend to produce a children book both to Please Allah and make a profit from it. if you accept a manuscript do you then own everything? Again this is uncharted terrioty for me so please excuse my ignornace. I am Jahanzeb Jahan, Lecturer in English in University of Education, Lahore, Pakistan. I have the honour that Allah Almighty has enabled me to use my creative and literary abilities to write the First ever Alliterated Poem on the Life of Prophet Muhammad PBUH of Almost 7000 words. It covers the major incidents of Prophet’s PBUH life from birth to His wasaal. The book is written in alliteration which took me a long time to write it. Alliteration is the occurrence of the same letter or sound at the beginning of adjacent or closely connected words. This work is unique in its kind. Since you have a big name in publishing field, I extend you my proposal of having the reward and Ajar for publishing this work. If you are really interested in this work, I will e mail you the extract of it for your satisfaction. PS: the poem is in composed form.